Android’s open source approach makes it possible for almost anyone with the initiative and resources to start doing offering customized Android apps and services. Amazon is one such company, taking on Google’s Android Market with its offering, the Amazon Appstore. The Google Android Market is the default phone app and website, for almost every Android device and for all Android users with a Google account, to download, purchase and manage Android apps. Consider it like a central shop: if you want a program for your phone, you go to the Google Android Market. Google saves all your purchases, app settings and more in your Google account. That allows you to switch phones and tablets and instantly have all your already downloaded or purchased apps downloaded to the new devices, for free and without any extra step from your side. The Google Android Market is so popular and commonly used that it is commonly referred to as simply the “Android Market”. Amazon Appstore aims to do the same, with a twist: the focus is more on your Amazon account and the Amazon set of preferred apps. Amazon Appstore offers perks like a free premium Android app a day. In addition, Amazon gives any Android device the ability to connect directly with your Amazon account and do more than just download apps. In the end, however, is Amazon’s Appstore a good replacement for the Google Android Market? Is the official Android Market still the one and only option you should consider? 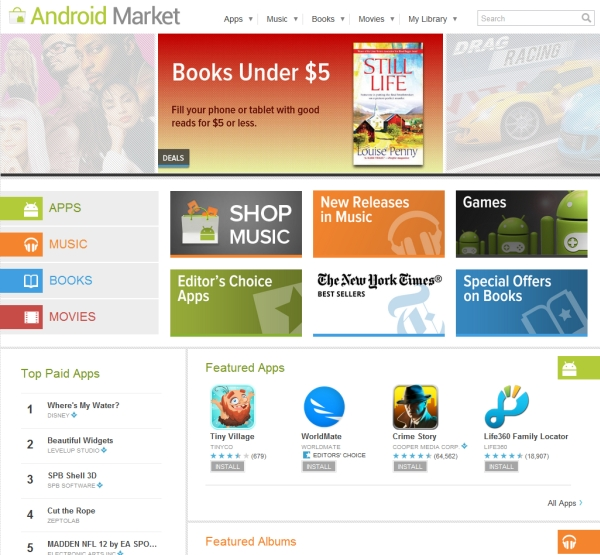 The Android Market is the official and largest online Android app collections library. It is maintained by Google, who allow anyone to submit an app to it, and to allow everyone to link all their Market activity and apps to their Google accounts. Amazon identified a big market in Android due to it being open source, and used it as a starting point for its latest and most powerful device, the Kindle Fire, and also start its own Amazon Appstore. While it’s good to have more than one option for your apps, problems arise when you start managing accounts for such apps. All Google Market purchases are associated with your default Google account. Almost all Android stock and custom ROM’s for all phones and tablets, or the operating software for such devices, come with the Google Market by default. Amazon’s Appstore, on the other hand, is offered separately and requires an Amazon account. That means you’ll need to start managing an Amazon account separately. However, Amazon’s does have a big driving force behind it, because it’s run directly by Amazon. The latest editions of the wildly popular Amazon Kindles utilize the Amazon Appstore fully, and Amazon is focusing non-stop on promoting its Appstore to every Amazon user. Which one should you choose? Or should you choose both? To help see the differences between the marketplaces, let’s look at the good and bad points of each. The Android Market has better relationships with developers and confirmed prices. Developers appear to be benefiting more from being on Google than Amazon, as Google focus on allowing anyone to submit the app and have it available in the market at a fixed price that the app developer specified. Google simply takes a cut of each sale, unless the app is offered for free by the developer. In contrast, Amazon focuses on direct partnerships. If such partnerships end, the app usually gets pulled from the Amazon Appstore, as history has demonstrated. The developer of the one of the most famous Android games, Apparatus, has more info on how the Amazon partnership did not help him. Basically, Amazon developer contracts allow Amazon to change prices and the amount of money paid for each app to developers, without asking the developer first. While the developer still gets paid with such price changes, developers usually make less money via the Amazon Appstore, and have less control over their apps in the Amazon Appstore. Apparatus review and comparison coming soon, by the way! Google Android Market offers free 15 minute trials. All Google Market purchases can be fully refunded within 15 minutes of purchase. Amazon Appstore offers no refunds. Google Android Market offers real device control. If an app is not compatible with your device, Google will not show it on your phone, or will let you know that you shouldn’t buy that app. Amazon has no such device exclusion control, thus you can end up buying apps which do not run on your specific device or Android version. There are many apps with low ratings in the Amazon Appstore, because the customers could not run apps as they were incompatible with their device. Amazon did not notify the users of such specifications, and the customers ended up purchase apps that Google Android Market would not have allowed them to. Google Android Market has over 400,000 apps. In comparison, Amazon has less than 5,000 apps. And I can’t think of any Amazon Appstore app that is not on the Android Market. Can you? Google Android Market is tied directly to your Google account. Your Google account gives you Gmail, Gtalk, Google Calendar, Google+, and dozens of other services. Since every Android device allows you to log into your Gmail account, you use the same account to manage your Android app purchases via the Android Market. If you switch devices, all you have to do is log into the new device’s Google account with your account info. In contrast, except for the latest Amazon Kindle Fire, almost every Android device will have you logging in and downloading Amazon Appstore separately, requiring you to log into the Amazon Appstore separately while you also have your Google account on the phone. You’ll have 2 accounts, Google and Amazon, to basically do what your main Google account can do already, and much better too. While the above are very strong points, Amazon is offering the Appstore with some strong tricks up its sleeve which is prompting an increasing number of people to try it out more and to use it more. Amazon Appstore is less than a year old, launched in March of 2011, and thus is still learning. It already has some solid advantages over Google Android Market. Amazon Appstore offers a free Test Drive. While Google Market allows you to refund any app within 15 minutes of purchase and Amazon does not, Amazon takes the concept to a different level: Amazon allows you to test drive almost every app for at least 30 minutes in a virtual browser on your computer. Amazon calls it the Test Drive Apps. Through your browser, you can see exactly how the app functions, demonstrating the actual use. You can run the app, play the games, change settings, go through calendars, etc. Note that this does not guarantee that an app will run perfectly on your device. Unless Google’s Market offers an hour of refund time, Test Drive will remain the superior option. Google Android Market starts counting the 15 minutes trial from the moment you purchase the app, and not from the moment you actually get the app installed onto your phone. Since many apps require a long time to download and then configure, there are many users who complain that their entire 15 minutes trial time was spent download the app in question. 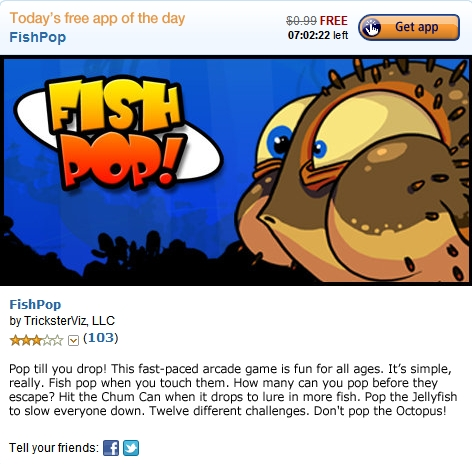 Amazon Appstore offers one Premium app for free daily. For about a year, Amazon has offered one premium app for free daily. That means you keep the app and get upgrades for free. Amazon Appstore is tied to your Amazon account. Amazon is the largest online store. Amazon makes it super easy to see your app purchase and download history directly from your Amazon account. 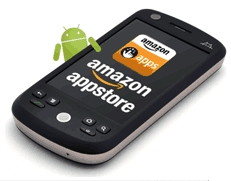 Amazon Appstore has one on one partnerships with developers. As mentioned before, Amazon is focusing on partnerships instead of relationships. If you have a good partnership with Amazon, your app can be promoted heavily, and without any charge to you, on the Amazon website. Even though the developer relationship point is a negative one against Amazon Appstore, if your partnership is going well, you can reap a lot of downloads in return. This is one of the reasons the Amazon Appstore is able to offer you a premium app for free every day. Which App Store Do I Trust More? I prefer simplicity, and I’m also into consolidating where possible. For me, the Google Android Market is the superior offering, and something that I consider my main, and only App source. Amazon Appstore is a very stable offering also, and for Amazon customers, it allows all app purchases to be combined into the same Amazon account. However, there are two major shortcomings. First, Amazon Appstore has few apps compared to the 400,000 on the Google Android Market. Second, I have gotten at least 4 Amazon Appstore premium apps, including the Apparatus game app, which have now been removed from the Amazon Appstore. There is no way to download those apps from Amazon anymore. All such developers have gone back exclusively to Google Android Market, citing partnership and revenue issues. I want a stable App shop where all my apps will be there forever and will not disappear solely because Amazon did not have a good partnership or contractual agreement with the developer in question. While Amazon Appstore is not something I use, I do wish I could access some of its tools more often. For example, I’ve tried the Test Drive Apps feature extensively, and it’s beautiful. Sure, it may not be a confirmation that the app will work on my specific phone or tablet, but it gives me a 100% clear idea of exactly what the app has, what its menus look like, how it behaves, what I can do with it, and more. Nothing else out there online comes even close. The 15 minute trial offer by Google Android Market is indeed not a very serious incentive by Google, in my view. Google’s rationale may be that many people can download an app and then make copies of it through various methods and then claim a refund. However, because of that rationale or other reasons, the millions of users who want to try out apps are left in the dark or have a very limited window to test stuff under. Many Android developers have worked around the short 15 minute trial window in Android Market, offering two separate versions of their apps. One version is something they can pay for instantly, and the other one is a free trial they can keep for ever with limited features. Many other developers are offering basic versions of their apps for free while offering premium versions with a key. This works like a freemium model, while also allowing people many days or even months to test out the free version of an app before making the purchase for the premium features. Which Android Apps Shop Would You Trust More? I use the Google Android Market, and rely on it fully. Even though I got several premium Android apps via the Amazon Appstore, managing them via an extra account for me seems like an unnecessary thing when I can have the same thing via the Google Android Market. In the end, though, the choice of which Android Apps shop to choose depends on your preference, which company you want to handle your digital Android purchases, what kind of apps you’re looking for, and more. You can only come to a conclusion after you’ve bought and downloaded one paid app from the Google Android Market and one paid app from the Amazon Appstore. Which Android Apps Shop do you prefer in the end? 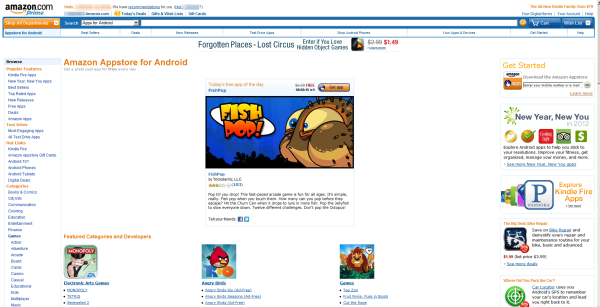 What do you think of the Amazon Appstore? How do you like the Google Android Market so far? Which one would you use and recommend, and why?